Should You Use a National or Local Bank? Looking for a bank for your business? The number of options may seem overwhelming, but you can start by splitting your choices into two categories: national and community banks. Read on as we look at the differences between the two types to help you make the best choice for your business. 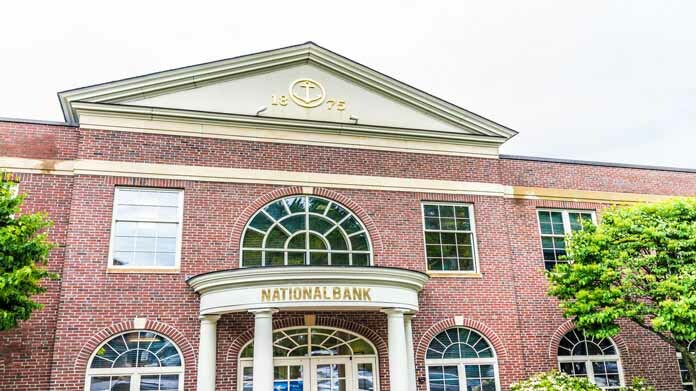 Widespread Accessibility: National banks have thousands of physical branches and ATMs across the nation, making it easy for account holders to access their services whenever necessary. Some banks even have international locations, which is important to consider if you travel for business on a regular basis. Advanced Technology: National banks tend to offer better electronic resources, such as online and mobile banking options. These resources are helpful if you need to access your bank after-hours. More Financial Services: Banking with a large institution will give you access to more than just basic accounts and loans. If your business decides to look into investing or brokering, a national bank will have special advisors to help you take those steps. Less Personal Service: Using a bank that has a global reach opens up the possibility of being seen as just another account number. Higher Fees: Larger banks often come with higher interest rates, which is important to consider if you’re working within a tight budget. Stricter Regulations: Getting a loan from a national bank can be difficult if your business is new or if you have a low credit score. Because of their size, these banks won’t be as understanding about personal circumstances should your business fall on hard times. Another option to consider is choosing a bank in your community. Local (or community) banks cater to a smaller clientele, and often have an increased focus on helping local businesses grow. Better Customer Service: Since their employee turnover rate isn’t as high, you can establish better, more personal relationships with your bankers at community banks. Furthermore, a smaller system means easier access to more highly-ranked employees. Lower Fees: Community banks tend to have lower ATM and monthly fees, which can make a significant difference for small businesses with low funds. Flexible Lending: Having a more personal relationship with your bank can open up a lot of financial opportunities. Community banks tend to be less restrictive with their lending practices, making it easier to get a business loan with a lower credit score. Limited Locations: Depending on how small a community bank is, its reach may not extend beyond a single state. While this may be fine for a local operation, it could pose issues if you decide to expand your business. Plus, even if your community bank offers online services, it may prove difficult to make cash deposits or execute other transactions out of state. Fewer Services & Smaller Loans: Small banks typically only offer a basic range of business services. Plus, while obtaining a loan from a local bank may be easier, they may simply not be able to provide the amount of funding your business needs. Less Stability: While national banks are not invincible, community banks have a higher chance of going under. If you decide to use a community bank, it’s important to keep in mind that your finances may be at greater risk. Deciding on a bank that best fits your business is tricky -- there’s no across-the-board answer for everyone. Before settling on a bank, consider what your business’ specific needs are. Perhaps you only need a simple business checking account, or maybe you want a bank that’s able to offer more sophisticated financial services. Whatever the case, we encourage you to take the time to shop around and learn what each bank can offer you.